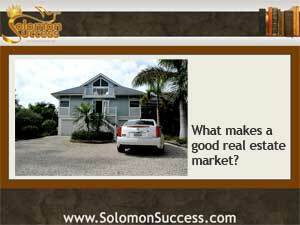 Solomon Success > Blog > Where Are 2014’s Best Markets? Where Are 2014’s Best Markets? The road to prosperity, says King Solomon, is paved with wisdom and discernment. And those virtues are especially important for investors negotiating the shifting landscape of today’s housing markets. Financial experts and economists may talk in broad terms about the US real estate market, but there really is no such animal. Real estate markets abound all around the country and they’re very different in key ways that affect investing success. But the best markets for the coming year just happen to share some features Jason Hartman’s been talking about for some time. The investing site Bigger Pockets recently posted stats from RealtyTrac on the state of real estate in 2014. And while it’s apparent that there are good and bad markets everywhere in the country, some markets can be deemed “best” for cash flow investing. What puts a market on the “best” or ‘worst” end of the scale? The answer lies in the Annual Gross Yield, which RealtyTrac calculates by dividing the average annual rental income of a property by the median sales price for homes in the area. The higher the yield, the better the market for investors. Using that formula, RealtyTrac determined that the best markets for investing cash flow are found in the middle of the country, while the “worst” markets – those showing a low Annual Gross Yield – are not surprisingly located on both East and West Coasts. Those “bad” markets include California, which leads the list with 6, New York and Virginia, with New York earning the dubious honor of the worst of the worst. There, the median home price is $887, 000, while rents average $1.852 – bringing in an annual gross yield of only 3%. Contrast that with the “best” market on RealtyTrac’s list – Wayne County, Michigan, home of severely depressed Detroit, where homes sell for around $44,000 and rents average $1,124. That, says RealtyTrac, equates to an annual gross yield of 30%. Statistics like these don’t always take all variables into account of course – and those markets where home prices are low and annual gross yield is high may also have a high vacancy rate as well as other problems. And Bigger Pockets, which reported the RealtyTrac information, notes that investors need to research markets themselves, taking into account the entire local context of a given property. That includes factors such as local ordinances, general economic conditions and even prevailing landlord-tenant laws. Employment opportunities and the nature of the local rental market play a role too. Turner, Brandon. “The Best (and Worst) US Real Estate Rental Markets in 2014.” BiggerPockets Blog. BiggerPockets.com 1 April 2014. Do Government Subsidies Prop Up Big Banks? What Happens to Housing in 2014?